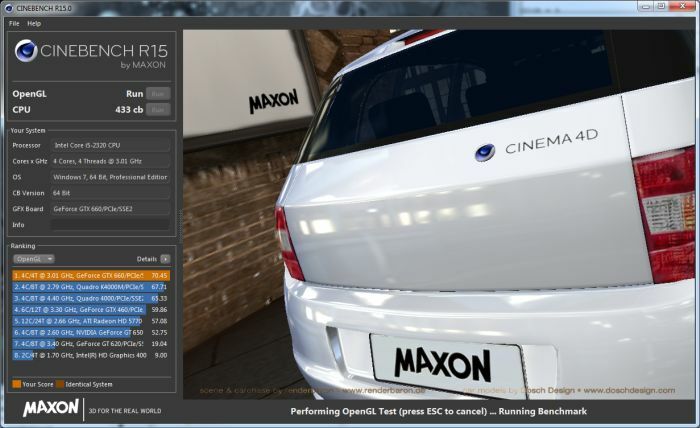 Maxon CINEBENCH is a 64-bit cross platform (Windows Vista/7/8 and Mac OS X 10.6+) benchmark for the GPU and the CPU based on CINEMA 4D. The GPU (OpenGL) benchmark renders a scene with many effects and made up of nearly 1 million polygons. The CPU benchmark renders a photorealistic 3D scene (raytracing) and exploits all CPU cores. 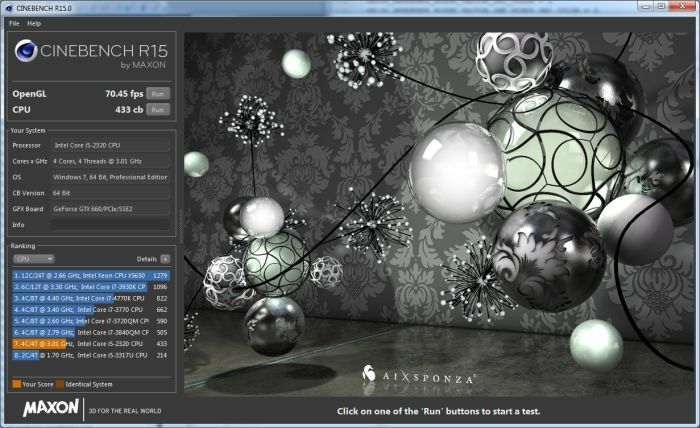 You can download CINEBENCH R15 from this page: MAXON CINEBENCH. Attention!! This benchmark has only informative value for Cinema 4D users. This is especially for testing GPUs. You will recognize that even the K5000 is slower that a small GTX. This is because the OpenGL part is a fake!! C4D uses 1 CPU-Core also for driving the GUI! So if you have a NVIDIA Quadro and you will benchmark your card, ignore this benchmark! Use f.e. Unigine with OpenGL settings. @C4Dspecialist: Do your Quadro get abnormal performance?? isn’t this company double the performance of one of these scene between core2 and sady bridge cpu ? long time ago , i remember i played with maya 3D . draw a kind of road care, see that as a 3D draw tutorial , wich i never finished.but like to remember about ! amusing, my 680 gets a lower score than the 275 and 550ti (both more or less equal in score) it replaced. This occurs on both 11.5 and 15, and no amount of messing with driver settings seems to make up the difference. not to mention this app has unusual loading of the gpu, differing every start and not being impacted by threaded rendering, vsync, p-state etc. This benchmark is purely an AMD marketting tool. obs: Nvidia 331.40 , GPU stock clocks.